Excessive alcohol use causes approximately 88,000 deaths each year, making it the third leading lifestyle-related cause of death in the United States. Alcohol affects every organ in the drinker’s body. While moderate alcohol use can have some health benefits for adults, heavy alcohol use and binge drinking can harm the body, disrupt relationships, and lead to risky behaviors, injury, illness, or death. Furthermore, any alcohol use can cause permanent harm to underage drinkers and to the unborn children of pregnant women. 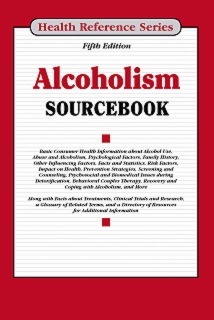 Alcoholism Sourcebook, Fifth Edition provides readers with updated information about alcohol use, abuse, and dependence. Physical alcohol-related effects on the brain, heart, liver, pancreas, bones, nerves, lungs, stomach, kidneys, and immune system are described, and mental health issues that often accompany alcohol problems are discussed. A section on the problem of underage drinking looks at the causes and consequences of drinking among adolescents, and another section discusses the effects of alcohol use on reproductive and fetal health. Facts about alcohol’s impact on families, workplaces, and communities are included, and guidance is provided for helping someone with an alcohol problem receive appropriate treatment and recovery services. The book concludes with a glossary of terms related to alcohol use and abuse and directories of resources for support and additional information. Part I: Understanding Alcohol Use, Abuse, and Dependence reviews guidelines for the safe consumption of alcohol and offers facts about identifying when alcohol use transitions into abuse and may precipitate problems. It explains the course of alcohol dependence and discusses risk factors, including genetic links to addiction vulnerabilities. It further discusses myths about alcohol use. Part II: The Problem of Underage Drinking describes the overview of underage drinking and also explains the drinking patterns and alcohol-related problems experienced by teens and college students. It discusses alcohol’s impact on development, offers prevention strategies for families, schools, and communities, and explains the rationale behind laws establishing a minimum legal drinking age. Part III: The Physical Effects and Consequences of Alcohol Abuse gives facts about alcohol impairment from various levels of blood alcohol concentration (BAC), alcohol poisoning, and alcohol hangover. It describes how alcohol changes the brain and affects the liver, cardiovascular system, kidneys, lungs, bones, and other organs. Information about alcohol interactions with other disorders and medications is also included. Part IV: The Effects of Alcohol on Reproductive and Fetal Health describes about how excessive alcohol use causes risk to both men and women’s health. It also explains how alcohol use impacts the reproductive organs and how it can lead to life-long impairments among children of women who drink during pregnancy. Detailed information about the effects of alcohol on a fetus is presented along with a discussion of fetal alcohol spectrum disorders (FASD). Part V: Mental Health Problems Associated with Alcohol Abuse discusses the impact alcohol has on anxiety disorders, depression, posttraumatic stress disorder (PTSD), and attention deficit hyperactivity disorder (ADHD). Separate chapters describe the connection of alcohol with other addiction disorders and suicide. Part VI: Alcohol’s Impact on Family, Work, and the Community includes information about children living with alcohol-abusing parents, interpersonal violence related to alcohol, the effects of alcohol-impaired driving, social risks and problems associated with alcohol use in the workplace. Part VII: Treatment and Recovery discusses helping strategies, programs, and support groups for families and individuals who decide to change their alcohol consumption habits. It describes alcohol addiction screening and explains the differences between brief interventions and long-term treatments. It also offers facts about the treatment process and explores new treatment options, including information on detoxification, withdrawal, pharmacological treatments, integrated treatments for co-occurring disorders such as drug abuse or mental illness. It also provides information about counseling and long-term support for those with disorders. It also discusses about the gaps in clinical prevention and treatment for alcohol use disorders. Part VIII: Additional Help and Information provides a glossary of terms related to alcohol use and abuse. Resource directories with listings of support groups for alcohol-related concerns, state agencies for substance abuse services, and organizations with additional information about alcohol use and abuse are also included.